Poetry readers can pick up a new collection from Myra Schneider with absolute confidence that there is quality within. Penelope Shuttle comments in ARtemis poetry, that ‘This poet, enters the daunting yet essential regions where we face ordeals and seek understanding in and out of the toughest places in the world, both private and public.’ Schneider’s tenth full collection amply fulfils this expectation. This is a book in three sections, which from the first poem, a sonnet in block form, offers a landscape viewed through the lens of nature, archaeology, and history. ‘Winterlight’, opens with a bleak image in a section where shadowy places are explored. you make your way to the dark world outside. its brilliance dead – not a hint of a jewel. Surprised, but undaunted, she turns it over in her hand and in her mind’s eye, finding history there that is both universal and intimate. of all being – and I love it for surviving. My small self dissolves in landscape. The faint shape of a boat crossing the river. Above the water, the thin cry of a bird. a heavy load in a farmer’s cart. clothed in frost. Above it a pale sun was emerging. Part Two opens with a longer poem, ‘Discovering Medusa’. The myth of the snake-haired gorgon is an ever popular and tantalising subject for writers of all genres. Schneider relates her version from the point of view of Perseus, journeying in his helmet of invisibility, to sever the gorgon’s head to release his mother from an undesirable match. Set out in tercets, the tale is told straightforwardly, the deed achieved without fuss about a third of the way through, though after a goodly amount of scene-setting (ten tercets). if he was no more than a puppet of the gods? far and wide to plant evil in minds. Here the kitchen drifts back to her childhood kitchen; ‘…above the Clyde, a utility cloth on the kitchen table’, then back to the present where, as a news broadcast ends, red liquid trickling down her fingers, ‘spots the table’ leading into her mother-in-law’s table, evoking the kitchen of a refugee family in Stamford Hill. In ten graceful lines, Schneider muses on the refugee experience, on the miracle of survival/survivability, as she wipes the spilt raspberry juice (mentioned above), a gesture to wipe away the past, but retain the value and spirit of the memory. rooms where hope is coming into blossom. This is a big collection, coming well into an impressive poetry career, with so much to admire. 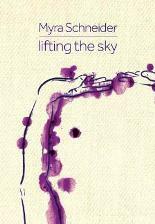 Rich imagery, a restless search for meaning, a sense of finding hope in nature, serenity in qigong, all play a role as Myra Schneider lifts the sky on humanity again.